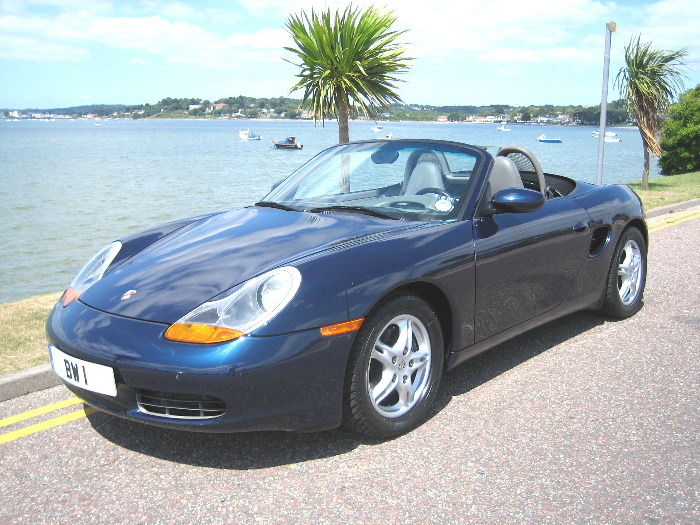 PORSCHE Boxster 2.5 Tiptronic S, 2 Doors, Automatic, Roadster, Petrol, 1997 P Reg, 53,000 miles, Metallic Blue. ABS, Adjustable seats, Adjustable steering column/wheel, Alloy wheels, Anti theft system, Central locking, Colour coding - Body, Driver airbag, Electric mirrors, Electric windows, Electrically adjustable seats, Front armrest, Head restraints, Headlight washers, Heated screen, Heated seats, Leather seats, Leather upholstery, Immobiliser, Lumbar support, Metallic paintwork, Power assisted steering, Remote locking, Radio/CD Multichanger, Spoiler, Sports seats, Tinted glass, Traction control. Carbon Dash Pack,Sport Exhaust,Powerhood,Wind Deflector,Left Hand Drive,Full Porsche Main Dealer Service History, p/x considered.